Belt Conveyor system is mechanical equipment that is used in the industries for transporting heavy or massive material from one place to another. Conveyor belt is the part of this system and carries the material while moving forward due to its motion around the two rotating pulleys. There are numerous types of conveyor belting on the basis of their design, material and applications. We manufacture an extensive range of belts such as Chevron, Rough Top, Heat Resistant, Steel Cord, Fire Resistant, Sidewall, EP, Transmission, Mines, Heavy Duty, NN, Crusher Plant etc that are used in a variety of industries. They are available in various dimensions, thickness, colors, surface finishes and are also customized as per the necessities of our clients. Various belts are made up of variety of materials such as spring steel, G.I., and stainless steel, heat resistant quality rubber etc. They are applied in a variety of operations such as Baggage Handling Systems, transportation of fragile as well as pack goods like papers, bags, glass etc, construction materials, coal handling, metal scrap from shaggy material to chips as well as turnings etc. Our belt conveyor is made up of high quality materials and is manufactured employing the latest technology available. We maintain the quality of our products at every stage of our production. We dispatch our final products after checking the quality of the belts on different parameters. Hence they are robust and have exceptional durability. These belts have outstanding features such as high Impact Resistance, High Tensile Strength, Excellent trough ability, excellent grip, High Efficiency, shock resistance, less friction coefficients, Resistant to high heat &amp; wear, ability to function under extreme temperatures, chemical resistance, High drive efficiency, fatigue resistance, Compact layout, Perfect Finishing, etc. They offer reliable performance and are easy to operate. They are also easy to install conveyor and offer safe transport. They are 100% trusted by several industries and are admired as fail-proof conveyance system. Several industries like Agro Industry, Chemical Industry, Ginning Industry, Mining Industry, Power Plants, port installations, Foundries and Steel Industry, Cement Plants, Fertilizer Plants etc within our country as well as abroad immensely demand our products due to their high quality, excellent features as well as reasonable rates. Our company, Shree Khodiyar Asbestos Co is located in Ahmedabad, Gujarat. We are the most leading conveyor belt manufacturer as well as exporter in India. Our products are immensely demanded in several countries such as Saudi Arabia, Kenya, Thailand, Trinidad &amp; Tobago, Australia, Brazil, Poland etc. Shree Khodiar Asbestos Co. is one stop intention of the high performing arts range of Steel Cord Conveyor Belts supplier India. 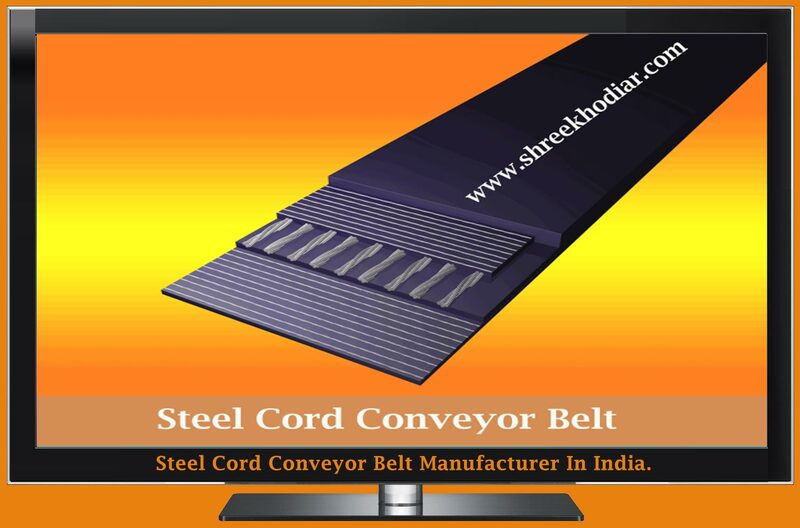 We are one of the well-known manufacturer and exporter of Steel Cord Conveyor Belts in Gujarat. We are pioneers in constructing Steel Cord Conveyor Belts that guarantee a high quality contravention shipment as well as good measurement fortification. With a strong source network we have been catering to the various industrial Steel Cord Conveyor Belts of our clients. We precisely design these Steel Cord Conveyor Belts and all our Steel Cord Conveyor Belts with the global quality norms and values. We use the high quality raw materials in the manufacture of the Steel Cord Conveyor Belts that guarantees their high arrangement and low protection company in Ahmedabad. We are a one best Conveyor Belt manufacturing company in Gujarat. The company deals with V-Belts, Conveyor Belts, and Couplings & Pulleys. The Industrial V Belts have also attracted various national as well as international clients as no alternative is available in terms of quality and performance.